I made another card for the current challenge at Sunny Challenges and Creations this time using the cute stamp set I Dig You. The challenge uses a sketch and you had to create a card suitable for a child. There is still another week to play along, hope you can join us. I embossed Whisper White card using the Houndstooth Embossing Folder and attached it to scored and folded Basic Black card. I attached Pacific Point striped designer series paper from the Brights Designer Series Paper Stack to Basic Black card and attached it to the left hand side of the card front. I attached Real Red striped designer series paper from the same Paper Stack to Basic Black card and attached it to the card front. 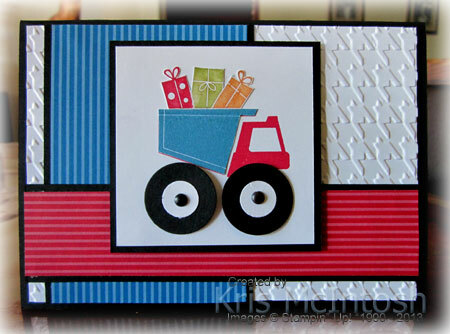 I stamped the truck in Real Red onto Whisper White card and then again in Pacific Point onto scrap Whisper White card. I cut the back out of the Pacific Point truck and attached it over the real red one. I punched two 1″ circles from Basic Black card, added Whisper White 1/2″ Circles to the centre, pierced a hole and added a Basic Black Brad from the Neutrals Brads Collection. I attached these over the red wheels using Glue Dots. I coloured the present image using Real Red, Old Olive and Pumpkin Pie Stampin’ Write Markers, cut it out and attached it over the back of the truck. The image panel is attached to Basic Black card and then to the card front using dimensionals. I punched one long edge of a strip of Basic Black card using the Scallop Border Punch and attached it behind Pumpkin Pie striped designer series paper from the Brights Designer Series Paper Stack. This is attached to the lower edge of Whisper White card. 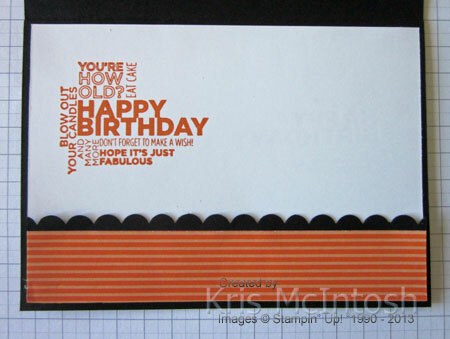 I stamped the happy birthday greeting from the Delightful Dozen stamp set using Pumpkin Pie ink and then attached the piece inside the card. I think this is a really bright happy card and I know my grandsons would love it. What do you think? 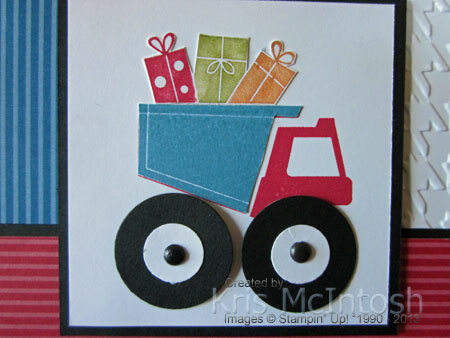 If you would like to make this card then you can purchase all the supplies at my online store. Well done, I’m not even a little boy and I’d love to get this colorful card! Even the inside is well thought out and almost could carry itself as a card front. Delightful card Kris…so special. Any young chap wld be happy to receive this.